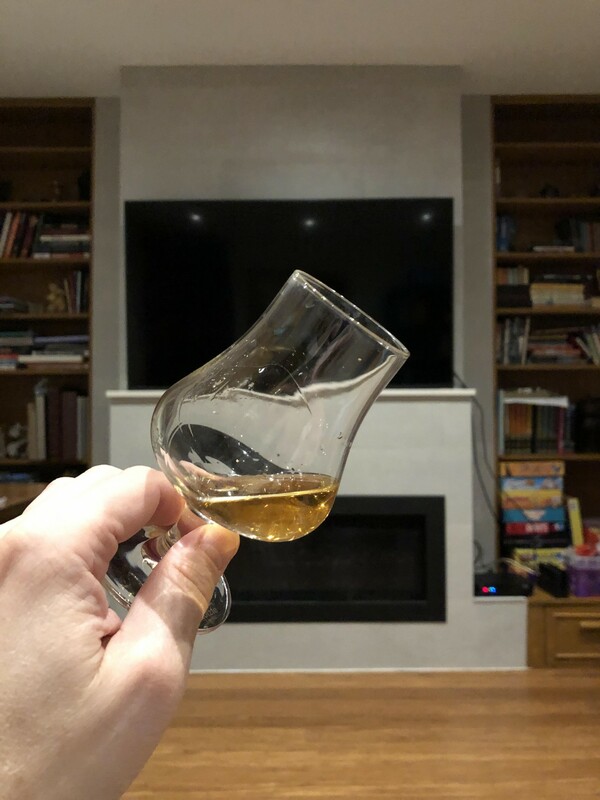 @MadSingleMalt - I must've been under a rock but hadn't heard of it until I just read @bwmccoy 's post! @MadSingleMalt "Croftengea is the new Ledaig, which was the new Ardbeg." Well said, I have to say though I always thought the madness coming from Loch Lomond was interesting but it seems ever since they acquired Glen Scotia and decided to shape things up, people are taking notice. Palate: One smooth criminal - good mouthfeel of a salty sweet caramel/toffee with a tinge of tobacco to round it all out. I could sip this all day long. I should bring this to work! I'm finishing the second half of a 40ml sample of Glen Garioch 1999 (14 year), 56.3%. I did my first tasting about a month ago, neat, and I'm doing this tasting with water added. Review to be posted soon. @archivist, sorry to hear about work woes. Glad a bit of whisky is transporting you away from it. Sadly the blend wasn't made by me, I only made up clever titles to disguise their identity. I do not have the blending chops of @paddockjudge. Out of curiosity which one was it? 2 months ago 3Who liked this? Feeling a bit under the weather so kept it at one small dram. Crown Royal Hand Selected Barrels. I opened it on Saturday and this is my second dram. Very creamy and rich, lots of oak and the proof delivers the flavors in spades. @cricklewood "11 Scents from Upper Canada" was very much needed and appreciated. I hope you feel better soon, but nice you were still able to enjoy a dram. 2 months ago 4Who liked this? @archivist that cleverly named ditty is ...Gooderham & Worts 11 Souls, probably one of the more technically assembled Canadian blends to be released in some time, although I think certain Crown Royal editions might give it a run for it's money. Those more knowledgeable than me can let me know if I've missed anything. It was my top pick of the 2018 special releases because I think it represents a departure from what we normally see in the Canadian whisky category. it retains those touchstones we can recognize but there is an attention that is paid to texture and development that is taken to a new level. @cricklewood what a creative blend, and a lovely treat - the different ryes give it a nuanced texture that I really enjoy...so I'm obviously no expert on Canadian whisky having only just recently sampling some from the reviews, suggestions on Connosr. The 11 Souls is very different from the Lot 40 that has been more of staple in my house now, and it doesn't have the same mouthfeel (not as strong?) and it's more gentle than Lot 40. If it was price right and readily available here in the US, I would definitely buy it. I have shovelled the driveway 3 times. There is a layer of ice shrink-wrapping my car. I think I have earned a dram. My whisky mentor went with Talisker 10 earlier, and so I will come as close to that as I can with Talisker 57 degrees N.
2 months ago 7Who liked this? @Nozinan it was 29 Deg C here yesterday and a cooler 26 today. Beer is the order of the day - a local Tuatara Kapai (Aotearoa Pale Ale) - just beautiful. I haven’t been on here in a while and admittedly taken a break from the water of life. Well I’m heading off the Edinburgh in April and decided it’s a great time to get back into some good whisky. Had Aberlour Casg Annamh today. Wow what a fantastic dram. Last time i had Aberlour it was an abunadh and casg wasnt around. I used to love abunadh but this was right up there, but may have to try a new batch of abunadh. Still a bit under the weather so I'm having my medicine, Talisker 10. I know I'm a day later mes amis but this one if for you. @Malt_Nuisance I think that new Aberlour caught a lot of flack, even with few reviews out there because it came hot on the heels of a substantial price jump in A'bunadh. @cricklewood It’s funny you say that. I just saw that the abunadh is a lot more now than when i was into whisky. I did find a local shop selling it at $79. Last night I had two pours of Wiser’s NHL Alumni Series Lanny McDonald Edition. This one is getting more interesting with time and air. It reminds me a wee bit of Gooderham & Worts Little Trinity, but it’s a little sweeter, with some flavours of glazed yeast donuts, vanilla frosting, and a little cinnamon sugar. My other half is out tonight so once the little one's asleep I'll be putting my feet up and sampling a few without distraction while I watch Watchmen. The Golden Hare ale went down lovely with my steak dinner. . . It's been quite warm today (two weeks ago schools were closed due to snow but today I've played golf in shorts and a polo shirt - milk bottles alert!) and although I'm hankering for peat I feel like some sherry/port, Quinta Ruben and Hazelburn oloroso with maybe a Pulteney 17 to cap things off, will work best. 2 months ago 6Who liked this? Friday night last night and a few small drams while I watched a couple of episodes of Breaking Bad. Only the second dram from my full bottle of Glen Scotia 15 (after finishing the mini). I like the flavour profile - salted caramel, earthy forest floor, hessian, oak spiciness, and a good mix of higher, mid, and lower notes woven together. However, it feels quite dialed back. Followed this up with Springbank 10 and yes, the SB blew the Glen Scotia out of the water with bags of flavour. On the back of the GS the SB displayed a pronounced medicinal note that hadn't really raised its head for me before. Very nice. And then Ardbeg 10 to round off the evening with something with more peat. A nice little progression over the evening. @Hewie - I often forget you're 12/13 hours ahead of me! Sounds like you really got into your whisky last night. You peeked my curiosity with the GS 15 and I was going to get a bottle for my upcoming bday; but I may be able to acquire a sample first. You make me think i'd be better getting a SB 10? @RianC Yeah we like to think of ourselves over here as the first to greet the new day. I got a Glen Scotia mini triple pack at Christmas and after trying them side-by-side the 15 stood out to me as the best. When it came up 'on offer' as you say I jumped on a bottle. As I mentioned I like the flavour profile by so far it seems a bit muted - hopefully it opens up a bit as the air gets to it. Some people mention it having a bitter finish but I didn't find that so much - it is a little tannic/dry but not unpleasantly so. If you can get a sample or mini do that first - I'd hate to steer you wrong. That Springbank 10 just ticks all the right boxes for me. It's one I just keep coming back to and I think I even prefer the 10 over the 12 CS. I've enjoyed trying a few different malts from Campbeltown and in my book the SB10 has been king. Honorable mention goes to Kilkerran 12 (which you know well) and Kilkerran WIP 7 CS Bourbon Wood. I still need to try the Kilkerran 8 CS. @RianC it's funny how sometimes we default to peat but then get into something else and it hits the spot. Your progression of Quinta Ruban, Hazelburn and OP17 sounds grand. @Hewie the revamped Glen Scotia line-up has been getting good reviews, same with Loch Lomond. What bottles we're included in your mini set? @cricklewood the 3 pack of minis from Glen Scotia has the Double Cask, the 15, and Victoriana. A nice little introduction to Glen Scotia's offerings. @Hewie I thought it was those but wasn't sure. I wish we had access to more tasting packs here as it's a good way to discover a distillery without taking too much risk. I'll keep my eye out for the GS15 once I recover from my recent purchase frenzy. @cricklewood yeah I agree - tasting packs such as these are few and far between. This just appeared around Christmas time. I've looked at others before, such as Bruichladdich, but some are 200mL bottles and end up a lot more expensive for a total of (3x200mL) 600mL - but atleast you get to try a few different bottles without committing to a whole bottle of something you haven't had before. Sadly we have very few minis available over here. It can be frustrating to have 70 bottles open, because at the rate I drink it could take years to get through just those and there are always new ones I want to open and try. On the other hand, when I really want a dram, I can usually find something open that fits my mood. I had a long, busy, tiring week. We had sushi for supper. I figured something with a savoury component would be good. I also wanted something big and substantial. I picked Springbank 12 CS. Rarely disappoints. My wife and I went out for Valentine’s Day supper, sans kids. I enjoyed a perfectly cooked (rare) 14 oz striploin and a glass of Argentinian Malbec, and then I had a small pour of Lagavulin 16, and then Ardbeg Corryvreckan when we got home. I’m currently finishing off the night (my wife has gone to bed; it’s been a tough week) with a total shifting of gears. I’m having some Weller Antique 107. I’m glad I have 2 backup bottles of this stuff as it’s like candy. Or should I say...it’s like sugar cookies with vanilla ice cream? Delicious! @Nozinan I'm sorry for your frustration in having so many open bottles Pleased you picked a winner for your end of the night dram though - top drop that. Last night we double dated with another couple - simple green salad using greens from their yard, and then a very hearty pork and sausage baked ziti. We drank a Grenache with dinner, I think from Santa Barbara. Went well together, and we all capped the evening off with Glendronach 12, and then Hibiki Harmony. I usually like Glendronach, but last night it was too "fresh", and I found out it was just recently opened and has not time to settle and open up. As such, it was a little burnt and harsh. The Hibiki made up for that, though, and it was balanced, crisp and sweet, and a good way to wash the Glendronach away. Amrut single cask (sherry cask) released 2014 at LCBO. I liked it best of the 2 single casks I tasted at Spirit of Toronto that year. But when they were discounted on 2015 I was able to get more bourbon cask bottles than sherry. So I didn’t open this one until last fall. It’s good, I especially enjoyed it tonightbur I have to say my palate has matured and I get a lot more out of the bourbon single casks I’ve opened. Opened my Ben Nevis 10 earlier while I made some gingerbread men with the little one (well, gingerbread birds, trees and circles - the 'man' cutter wasn't found until after the event - typical!) Now, I remember Arnold Schwarzenegger once suggesting one shouldn't drink and bake but I only had a small pour, honest, Kaminski! Very impressed! Bold, old school sherried whisky with a long spicy finish. I think I've just made a new friend!